This past weekend trip was full of good times, as there were some fish around to be caught and the Bell Ringer was quite lively on a nightly basis. 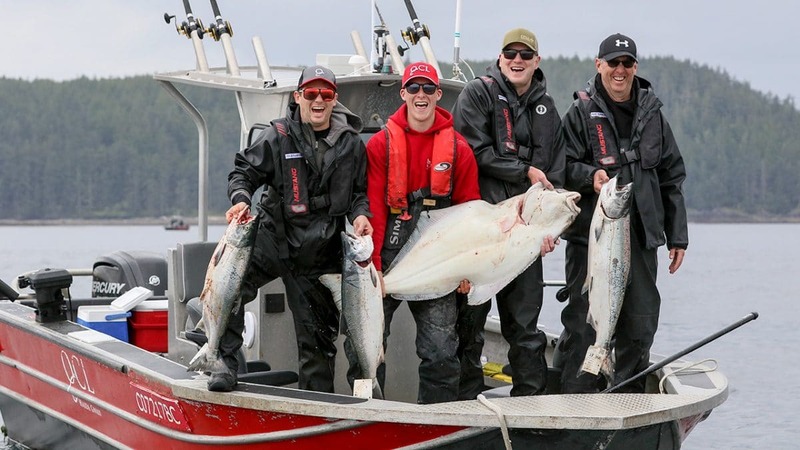 The fish coming in consisted of a combination of nice Chinook, Coho, and Halibut. 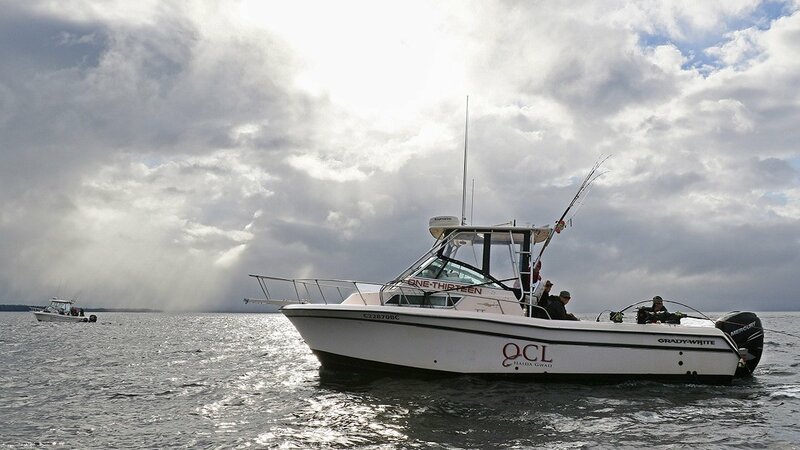 Many boats decided to spend a good majority of their days offshore, targeting Coho with the odd Chinook and Pink salmon in the mix out there as well. This style of fishing certainly produced the most consistent action for anglers. Inshore, the waters surrounding Cape Naden and Bird Rock 1 produced some nice Chinook for those who chose to “stick, stay, and make it pay”, particularly through the afternoon low slack tide. This fishing was quite interesting at times, as it was often a race to sneak the fish in past a couple of hungry sea lions. Today we had a new group of guests come in for our weekday trip and they were all very excited to get out on the water! 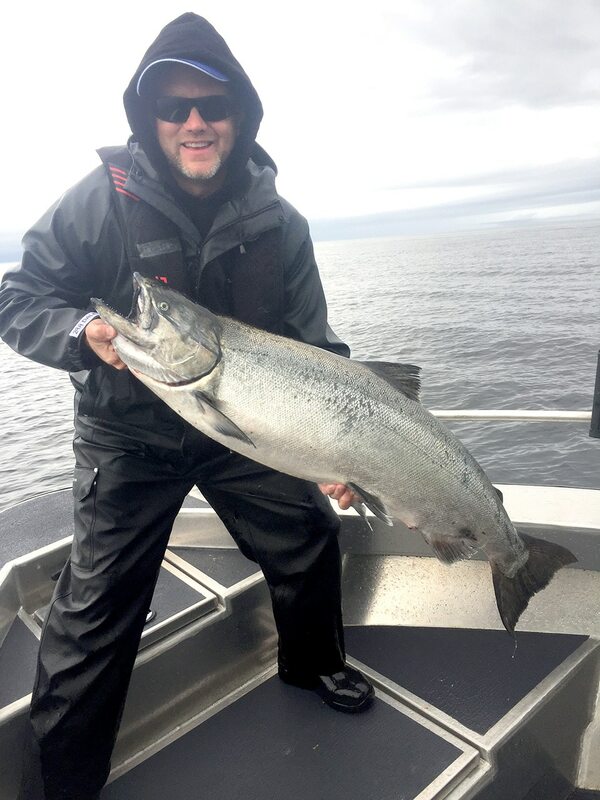 While on our way out, my guests and I decided that today we were going to stick inshore in hopes of hooking into some large migratory Chinook salmon. After making this decision, I knew exactly where I wanted to drop the lines. A few minutes later we had three lines in the water at Bird Rock 1. As the day passed by, boats would come and go, with many choosing to make their way offshore in search of Coho and Halibut. After a slow start we decided to grab some lunch at the MV Driftwood. 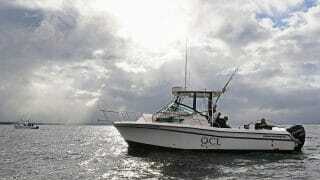 Then, following a short discussion, we decided to keep sticking it out inshore and back we went to Bird 1. Shortly after, we managed to put a nice 20-pounder in the box. With the low slack tide approaching I had a feeling that this was a sign that something good was about to happen. All of a sudden, right on top of the slack tide, our back line had a hard hit and my guest Dale was hooked into a real screamer. While clearing the other 2 lines we hooked a second fish that hit while I was popping the line out of the downrigger clip. Both of my guests were now into a couple beauties, with one screaming line off the bow and the other off the stern. After a couple of fun filled and chaotic fights this father-son duo managed to land their double header. In addition, Dale’s fish ended up being a 34 lb hawg! 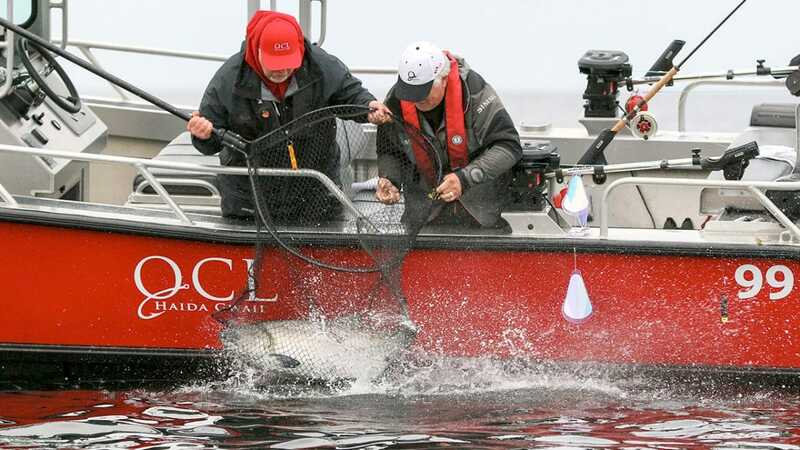 Although he had every intention to release any Tyee that he might catch on his trip, this one was hooked far too well for that to be a possibility. Regardless, he and and his group members were quite excited later on back at the Bell Ringer! We are all looking forward to the remainder of the trip!